! Pyramid offers a wide variety of amp wire kits made from sturdy materials able to hook up all your audio equipments from Amplifiers to Speakers up to your subwoofers providing a smooth and uninterrupted power transition from one device to another. 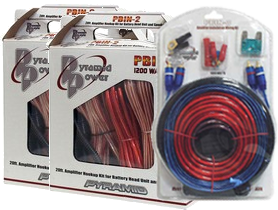 Make the most out of your car audio system using Pyramid Amp Wire Kits found here at HalfPriceCarAudio.com at a very reasonable price!